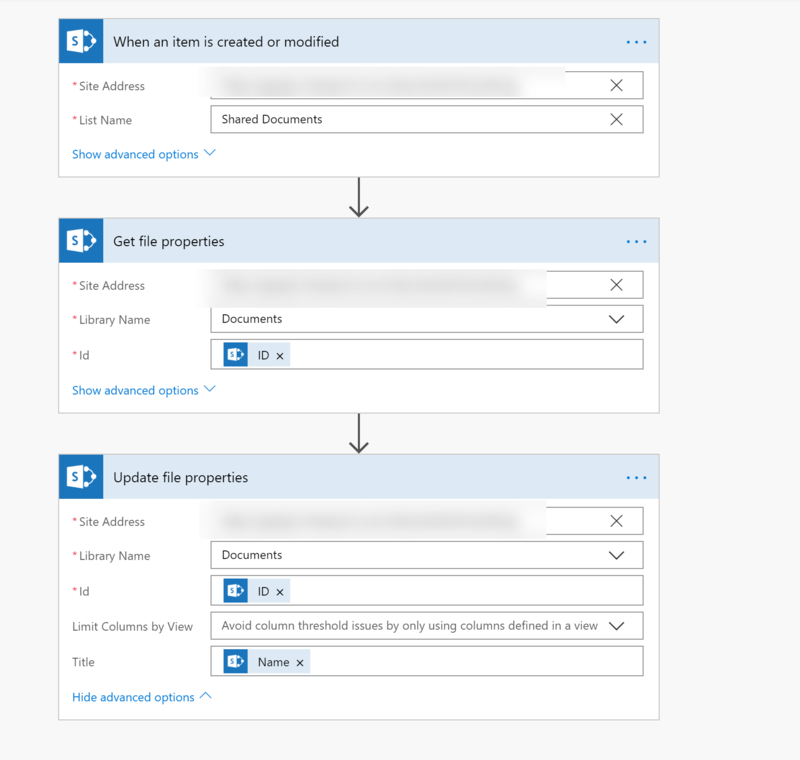 That's changed thanks to "modern" design in SharePoint Online. Modern design takes boring SharePoint pages and makes them feature rich, beautifully responsive, and pleasant to work with across any OS (Windows, Mac, iOS, and even Android). Best of all, they are simple to set up and use. This customer had 1000's of documents to update, plus they wanted to make sure any newly updated or created documents also followed suit. So how did we solve this? 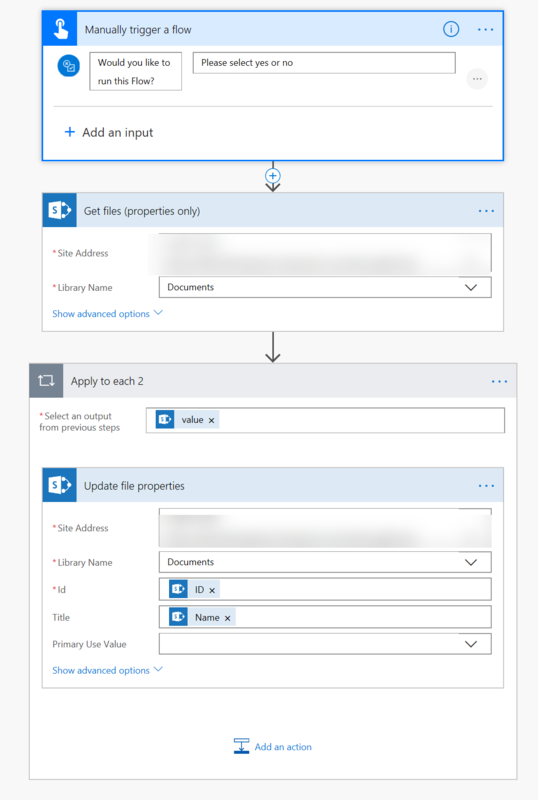 We wrote two straightforward Flows (you can learn more at flow.microsoft.com). Note: These Flows may or may not work in your environment. As always, we recommend that you test (and then test again) in a non-production environment to make sure you will get your intended outcome. Proceed with extreme caution and use at your own risk. The first Flow runs when you add new items or modify existing items. Now, anytime a new file is added or an item is updated, the Title will be set to match the Name of the file. This solves the issue for new documents. What if you have a ton of existing documents you would like to update? That's where Flow #2 comes in. You will need to choose an action to kick this Flow off, but just one time. In my example, I am just going to create a Flow Button for mobile. It doesn't matter what you use because you will be deleting the Flow after it runs anyway. This Flow will run through all the documents in your library and match the Title to the Name. You will need to take whatever action you chose in step 1 to kick off the Flow. Note: this may take a while for this Flow to run if you have lots of documents in your library. If you'd like to get more out of your use of Microsoft 365 and Office 365 - feel free to post your question here and one of our success managers will be glad to try to help! If you want to dive a little deeper you can also set up a call with one of our customer success managers - just follow the link below or give us a call (we won't pester you...promise!). Considering Office 365 for business?